Democratic Sen. Kamala Harris of California officially kicked off her presidential campaign in her hometown of Oakland on Sunday, promising to deliver on a series of progressive initiatives branded as a new populism. In the first major speech of her campaign, Harris, 54, advocated for Medicare for all, debt-free college, and a tax cut that will benefit working families. She additionally highlighted her record going after Wall Street after the financial crisis and spoke out against the so-called war on drugs. Harris targeted President Donald Trump and his administration's foreign and domestic policies and criticized racism, sexism, anti-Semitism, and homophobia in the nation. "We are at an inflection point in the history of our world. We are at an inflection point in the history of our nation," Harris said, speaking before a large audience of boisterous supporters. "We are here because the American dream and our American democracy are under attack and on the line like never before." Harris laid out why she was running for president, saying she is doing do because "I love my country" and a want to "fight for an America where the economy works for working people." "If I have the honor of being your president, I will tell you this: I am not perfect," the former California attorney general said. "Lord knows, I am not perfect. But I will always speak with decency and moral clarity and treat all people with dignity and respect. I will lead with integrity. And I will tell the truth." On that last point, Harris said the "biggest truth of all" was that although "we have powerful forces trying to sow hate and division, the truth is that, as Americans, we have much more in common than what separates us." Highlighting the recent partial government shutdown over Trump's demands for money for a wall along the U.S. southern border, Harris said Trump's "medieval vanity project is not going to stop" undocumented immigrants from entering the U.S.
Harris took a number of open and veiled shots at the president and his administration, saying "America, we are better than this." She criticized "leaders" for bullying and attacking the press and undermining democracy. She said white supremacist violence in Charlottesville, Virginia, and Pittsburgh, Pennsylvania, was "not our America." And in hitting the administration's policy of family separation at the border, Harris said: "Don't you dare call that border security; that's a human rights abuse." "Under this administration, America's position in the world has never been weaker," she said, criticizing the Trump administration's foreign policy. Later, she said she would "defend this nation against all threats to our cybersecurity" and will "secure our elections and our critical infrastructure." The crowd of thousands repeatedly erupted in chants of "Kamala!" as she spoke. Harris said "people in power are trying to convince us that the villain in our American story is each other." She said calls for unity would not be "a facade of unity." "That word has been used to shut people up or preserve the stats quo," she added. The Republican National Committee issued a statement on Harris' speech just before she took the stage that criticized her policies and choice of venue. "It's fitting that Harris chose the most liberal district in deep-blue California to launch her campaign," Republican National Committee spokesman Michael Ahrens said in a statement, adding that her policy prescription was "totally out of step" with the country. 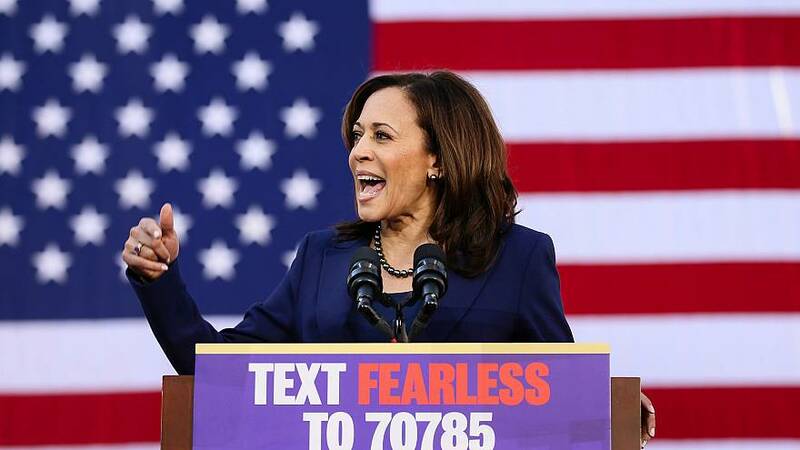 Jesse Ferguson, a Democratic strategist who has not yet committed to a 2020 candidate, told NBC News that Harris in her speech "showed us what makes her tick and why she believes what she believes — the most important things for any candidate to answer." "And with a simple statement that 'America is better than this', she contrast her values with a powerful indictment against Trump's leadership," he said. Harris' Sunday speech comes less than one week after she announced her intention to seek the Democratic Party's 2020 presidential nomination in what is likely to be a crowded field of candidates. If elected, Harris, the daughter of an Indian mother and Jamaican father, would be the first woman to serve as president, in addition to being the first of Asian heritage and the second African-American president. "This is not an ordinary election," Harris said in one of her closing lines. "But this is our America."